Looking up at the 205-foot neo-Gothic and art deco Singing Tower carillon is an experience like no other. Designed by famed architect Milton B. Medary and ornately crafted by noted stone sculptor Lee Lawrie, the Tower houses one of the world’s finest carillons. Concerts from the 60-bell carillon at 1 and 3 p.m. fill the Gardens daily. Interested in touring the inside of the Singing Tower? At the Sustainer Level Membership and above you will receive an invitation for two to one of the four annual Founder’s Room tours! Find out more about becoming a member of Bok Tower Gardens! So what’s behind the Great Brass Door? The first level of the Singing Tower contains a fireplace, antique furniture and a ceramic tile floor. 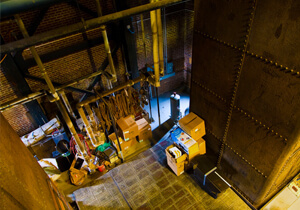 A 211-step wrought-iron and steel staircase begins on this floor and an original Otis electric elevator is still in operation today. 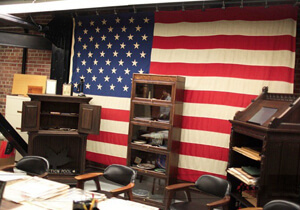 This dedicated archival room houses the correspondence, papers, plans, photographs and historic objects of the Gardens including the guest register signed by President Coolidge and Edward Bok on February 1, 1929. Two large tanks housed on this level were once used to irrigate the Gardens with water that would flow from the roof of the Singing Tower. Today, we use modern irrigation so these tanks are now used for storage. Our Facilities & Operations team use this workshop when working on projects within the Tower. Some of their tasks include polishing the Great Brass Door, maintaining the carillon, and servicing the elevator. 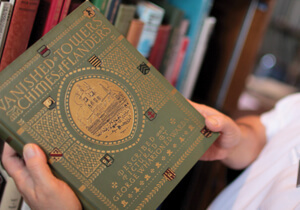 The library contains many of Edward Bok’s writings and is the largest collection of carillon history and music in the world including the Guild of Carillonneurs in North America Archives and the Ronald Barnes Collection. 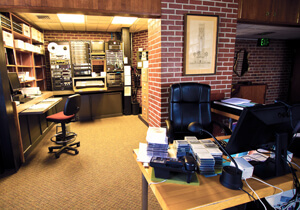 Recording equipment and carillon recordings are stored at this level. On the floor just below is a practice carillon which uses tone bars instead of bells and allows rehearsal without the music being heard in the Gardens. This level houses the 60-bell carillon and a soundproof playing cabinet for the keyboard. There are four balconies that look out over the Gardens and the surrounding area. 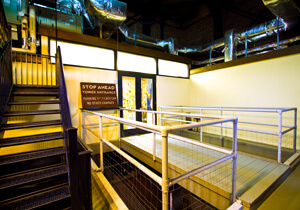 A catwalk staircase allows access to the roof. At the top of the Tower, 205-feet above the base, are eight marble heron statues. Several modern necessities have been installed on the roof including lightning rods and HVAC units. A platform allows access for maintenance. Bok, Medary and Lawrie made it a goal to create perfect unity and symbolism in the design of the Tower. The scheme for the sculptures and grille work is mostly birds and plants with a few other forms of wildlife depicted. Besides various flowers and trees, you can find cranes, herons, eagles, seahorses, jellyfish, fin fish, pelicans, flamingos, geese, swans, foxes, storks, tortoises, hares, baboons, Adam and Eve, and the serpent. The colorful tiles found only in the top third of the Tower were designed by J. H. Dulles Allen depicting the perfect balance in nature, species and gender. The Great Brass Door and wrought iron gates on the north side of the Tower are the masterpiece of Samuel Yellin, America’s premier metalworker. The door depicts the Book of Genesis, starting with the creation of light and ending with Adam and Eve being ousted from the Garden of Eden. The iron gates leading to the Tower were hand-wrought and showcase zoomorphic figures with various expressions and wings for flight. The sundial on the south side of the Tower was set in place on October 26, 1928. The gnomon, which indicates time by casting a shadow on the dial face, is made with a bronze rod supported by a bronze snake – the ancient symbol of time. The hours are marked by the 12 signs of the zodiac. A correction table for different periods of the year is located at the base of the sundial. Edward Bok’s Singing Tower was sited at the highest elevation south of the reflection pool, so the water reflects its full image. Bok commissioned fellow Philadelphian and architect Milton B. Medary to design and build the carillon Tower. A partner in the firm Zanzinger, Borie & Medary and president of the American Institute of Architects, Medary designed the Washington Memorial Chapel at Valley Forge, Pennsylvania and the Justice Department building in Washington, D.C. The Lake Wales project was an opportunity for Medary to adapt traditional Gothic design and incorporate the unique elements that represented Florida’s nature. His solution was an art deco and neo-Gothic tower built with a steel frame structure encased in beautiful coquina stone from St. Augustine, Florida, and pink and gray marble from Tate, Georgia. The Tower features sculpted finials, balconies, an arched entranceway, and elaborately carved screens, friezes, tiles, metalwork and sundial. Another first generation immigrant, Lee O. Lawrie, was selected to design the elaborate marble sculptures that adorn the Tower. Born in Rixdorf, Germany, Lawrie was a self-taught sculptor who earned a bachelor of fine arts from Yale and taught there until 1919. 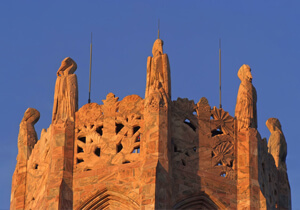 He received eight national architectural and sculptural awards and emerged as one of the nation’s foremost stone sculptors specializing in Gothic Revival themes. Some of his most famous works are the “Atlas” statue at Rockefeller Center in New York City, the famous sculpture of George Washington that stands in Cleveland Park in Washington, D.C., and the Nebraska State Capitol. Lawrie’s series of Tower sculptures represent themes of nature, humanity, the Bible and philosophy. The sculptural details are mostly comprised of American birds and plants, along with depictions of a man sowing a garden, a man feeding cranes, Adam and Eve, and the serpent. Upper balconies feature carved eagles with folded wings, and the panels depict doves carrying laurel or oak branches as symbols of peace, goodwill and strength. Besides various flowers and trees, there are cranes, herons, eagles, seahorses, jellyfish, fin fish, peacocks, pelicans, flamingos, geese, swans, foxes, storks, tortoises, hares and baboons. Born in Galacia, Poland, Samuel Yellin studied art in Europe and moved to Philadelphia in 1906. He founded Samuel Yellin Metalworkers in 1909 and became a major figure in the early 20th century arts movement and one of the most admired designers of decorative ironwork. Specializing in Renaissance-style iron sculpture and design, Yellin’s works can be found at: the Federal Reserve Bank in New York City; Philadelphia’s Packard Building; numerous churches throughout the nation including Washington National Cathedral; and on the campuses of America’s most prestigious universities including Yale, Columbia, Princeton and Harvard. 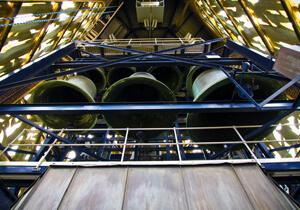 Bok enlisted Yellin, America’s premier metalworker, to create several elements to adorn the carillon Tower. Yellin designed the brass door and the wrought iron gates on the north side of the Tower. The great door depicts the Biblical story of creation, the Book of Genesis, starting with the creation of light and ending with Adam and Eve being banished from the Garden of Eden. The iron gates leading to the Tower were hand-wrought and feature birds with various expressions and wings for flight. Lawrie’s sundial on the south side of the Tower features a bronze snake, the ancient symbol of time, as well as the 12 signs of the zodiac to mark the 12 months of the year and Roman numerals to mark the hours of the day. The gnomon casts a shadow on the dial face to indicate the time. At the bottom of the sundial are the words from President Calvin Coolidge’s speech, “dedicated and presented for visitation of the American people” that commemorate the 1929 dedication of the Gardens. J. H. Dulles Allen, founder of Enfield Pottery and Tileworks near Philadelphia, created the massive, intricate and colorful tile grilles that adorn the openings of the bell chamber allowing the sounds of the bells to fill the Gardens. 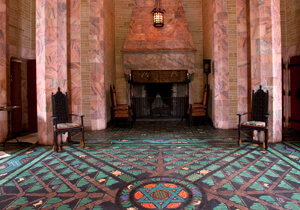 Dulles Allen also designed the tile floor of the Founder’s Room just inside the Tower. Through skillful craftsmanship of metal and tile, Dulles Allen transformed trees, birds, turtles and other plants and animals into a unique piece of art. The colorful tiles found only in the top third of the Tower depict the perfect balance between nature, species and gender. In addition to his work at the Gardens, Dulles Allen’s work can be seen at the Organization of American States building in Washington, D.C., and the Reynolda House (in the Museum of American Art) located in Winston-Salem, North Carolina.